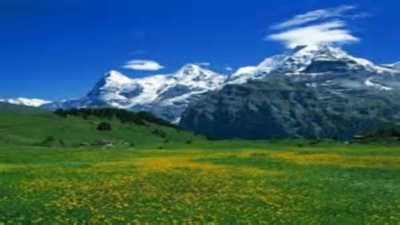 An ancient German folk custom was to plant arnica around fields of grain. It was believed that the spirit of a wolf wandered through the fields. 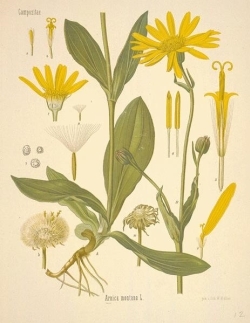 The arnica was thought to prevent the “Grain Wolf” from escaping before the grain was harvested, and that his spirit would enter the sheaves and strengthen the crop. Growing wild high on alpine mountainsides, the arnica flower is sometimes called a ‘mountain daisy,’ though you can always tell the difference because of its rich golden-orange color. The word “arnica” comes from a Greek word for “lamb’s coat” – soft hairs cover the green oval-shaped leaves that surround the flowers. A member of the sunflower family and related to dandelions, arnica plants thrive in temperate climates, and can be found in the mountain woods and pastures all along the central part of the European continent and the Pyrenees, and in the mountains and plains of Siberia, Canada, and the American northwestern states. Unusual among plants, it blooms in late summer or autumn. Its flowers are harvested when in full bloom, and then dried. In fall after the leaves dry and drop, the rootstalks (rhizomes) are collected. Both flowers and roots may be used in tinctures. Herbalists in many traditions have used arnica for centuries for its anti-bruising, anti-inflammatory and anti-microbial qualities. Plastic surgeons today recommend application of arnica cream after surgery and many athletes swear by arnica liniments to ease sore muscles, strains, sprains and bruises. 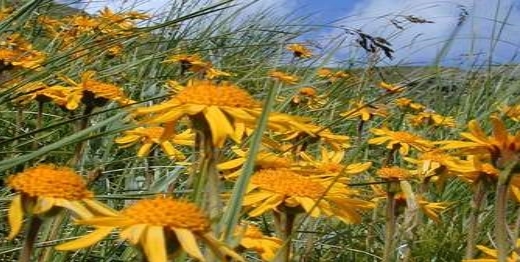 Science tells us that arnica acts by increasing local blood supply, which accelerates healing. It provides real pain relief for osteoarthritis and joint pain sufferers. It even has been shown to promote hair growth! Because of its wonderful healing properties for the skin, arnica is an integral part of LevensESSENTIE Gold ®. Paul Penders also uses arnica as a key ingredient for scalp cleansing and skin toning products. Watch this blog for more from the Paul Penders Organic Herbal Garden. Paul Penders products are formulated from organically grown herbs and flowering plants. Special cold blending and other scientific processes help retain the natural benefits of these gifts from Mother Nature. Do Consumers Need More Protection from Toxic Chemicals in Cosmetics? The world looks to the United States for leadership. The U.S. Food and Drug Administration (FDA) is the watchdog and sets the example for regulations on food and medicine. It’s the FDA’s job to ensure products are safe for human consumption. Yet the cosmetics industry remains mainly unregulated and many personal care products on the market are loaded with toxic chemicals. How many do you use each day? This month, another bill was placed before the U.S. House of Representatives by Reps Edward J. Markey (D-Mass.) and Jan Schakowsky (D-Ill.) called the ”(H.R. 1385) Safe Cosmetics and Personal Care Products Act of 2013.” This follows on the heels of two bills introduced a year ago – which never passed Congress. Years of tests are required before pharmaceuticals are allowed to be sold in the U.S. Any facility from slaughterhouse to restaurant that deals with food is subject to inspection. But there’s no such formal supervision of the cosmetics and personal care industry. The existing law authorizing the FDA has not been updated since 1938. Should it be changed? Pro and con – there are arguments both for and against giving the FDA more controls. Interestingly to me, several of the provisions in the new bill are already considered “normal” in the cosmetics industry. Principled companies tell the truth when making cosmetics and they use high quality ingredients. Yet it does seem good that consumer protection against harmful chemicals become part of the national law. Cosmetics is a $50 billion dollar industry. Some 12,500 chemical ingredients go into various personal care products – and most of those have never been assessed for safety. The Campaign for Safe Cosmetics says Americans use an average of 10 personal care products each day, resulting in exposure to more than 126 unique chemicals daily! We have already noticed a much rigorous inspection on imported cosmetics, and I think that all is for the good. Our company ran up against the FDA last year when a shipment sent from Asia arrived at a U.S. port and was stopped by an inspector. The inspection report we received said that the labels on the packages made claims for effectiveness that were not permitted. In spite of the fact that we always have had our products tested by independent laboratories in Australia, Malaysia, the U.S. and elsewhere, we are not allowed to make certain claims on packaging. Here’s one example: the product made of certified organic herbs known for centuries as a traditional sunscreen cannot be listed as such. We cannot claim it actually protects you from the sun even though labs have given it a high SPF rating. “Promoting a product with claims that it treats or prevents disease or otherwise affects the structure or any function of the body will cause the product to be considered a drug under the FD&C Act, section 201(g).” If it’s a drug, then the FDA regulates it. If it’s a cosmetic or personal care product, the only thing the FDA can do is say whether the labels are acceptable or not. Some of the claims made by the FDA can seem quite silly because they are so often a matter of language. For the past year, we have made an extensive – and expensive — effort to review all labeling on PP products and make changes to any wording that might imply medical effectiveness. 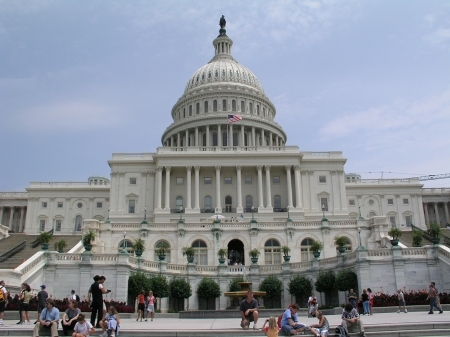 The Safe Cosmetics & Personal Care Products Act of 2013 could impact all cosmetic companies selling their products in the U.S. whether natural, certified organic, or any other type of cosmetic products. There’s still a long way to go — it needs to pass through both the House of Representatives and the Senate in the U.S. Congress and be signed by the president before it becomes law. Here are some of the highlights of the proposed bill. Each state could enact more stringent standards. requires companies to report to the FDA on adverse health effects associated with the use of a cosmetic product. Take a look at this entertaining video summary of the issue by Annie Leonard and the Campaign for Safe Cosmetics at: The Story of Cosmetics. We agree that the U.S. government does need to take action to protect consumers from toxic chemicals and the provisions in this bill do seem to be good precautions. Now you also know why Paul Penders products made with organic herbal ingredients are such a good and safe choice for your personal care. Since our company was founded some 40 years ago, we have made it a strict policy to avoid the use of potentially toxic ingredients in all our products. Gleaming, shining, smooth as silk – your hair can be one of your most beautiful assets! Ever have those days when you look in the mirror and your hair just seems lifeless, dull, even boring? What’s the difference between your day-to-day hair and all those models in the pictures with their highlights and super shine? Sure, it helps to have professional treatments and styling – and a retouch artist to fancy up your photos. But you can have ‘picture perfect’ hair without spending a lot of time and money in a salon. We have a number of recommendations for optimal Do-It-Yourself hair care in upcoming blogs. One real answer to beautiful hair is in how you treat your scalp. It’s not something you may think about a lot unless your scalp gets irritated or you develop scalp problems like dandruff. For many people, scalp health is just an after-thought – a quick shampoo, maybe some conditioner, and then it’s wash-and-go. But if you really want healthy, beautiful hair, then giving a little extra TLC (Tender Loving Care) to your scalp can have a real payoff. Diagnose and assess. A first step is to take a close look at your scalp in a mirror – you may want to get a friend to help. With a comb, part your hair to reveal the skin beneath. Notice whether it looks dry, splotchy, or if there are any unusual lumps or bumps. Do you see any flaking, peeling, or differences in color from one section to another? If you’ve been out in the sun, did your scalp get sunburned? Look along your hairline. This is an area where you can develop skin irritations or even infections but they are relatively easy to see if you look closely. Dirt, dust, and chemicals can also accumulate along the edges of the hair. It’s also an area where the pores of the skin can get clogged – you may see whiteheads or blackheads that need attention. Deep clean and massage. Press on various points on your scalp and you may feel a variety of sensations; you might feel a knot of tension, a sense of release, maybe even a little pain. Like muscles and tissues elsewhere in your body, your scalp can hold tension. Press and squeeze on pressure points found all over your head to help release tight muscles and help to get blood flowing more freely. Whenever you shampoo, you can turn a simple wash into a scalp massage treatment. Use your fingers to press and pull. Part and separate your hair so that the shampoo reaches down to the roots and the follicles anchored in the skin. Your hair and your scalp will both be cleaner. 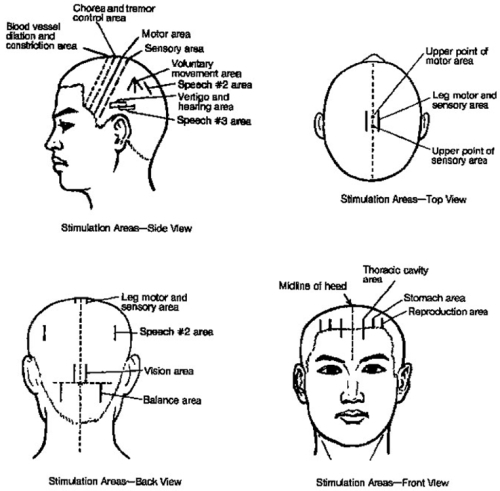 Traditional Chinese Medicine (TCM) identifies acupressure points on your scalp that relate to other organs. Use two or three fingers at a time to press and make circles wherever you feel a point of sensation on your scalp. Tone and refresh. Paying attention to the condition of your scalp can make a big difference to your appearance. Like skin everywhere on your body, your scalp needs nutrition and stimulation to improve circulation. You want it to be very clean but at the same time, you don’t want to strip of its natural oils and sebum produced by the sebaceous glands just under the skin. Harsh soaps, shampoos, styling gels, hairsprays, and hair dyes can upset the natural balance. We recommend use of a scalp toner like Paul Penders Holy Basil Conditioning Scalp Toner to help rebalance and support the health of your scalp. Your beautiful hair starts at the right at the roots. Make scalp care an important part of your beauty regimen. 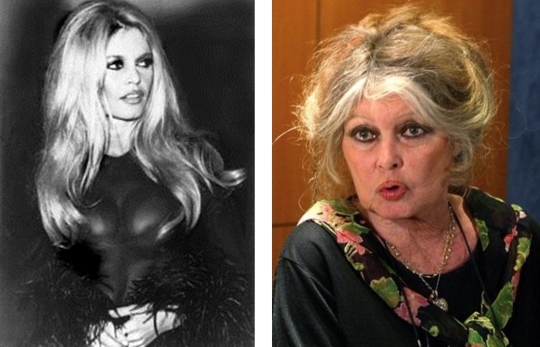 Through the years since her retirement from films in 1973, she has received international attention for her strong stances against animal cruelty. She has fought many battles against the killings of seals, dolphins and other marine animals, the consumption of horse meat, and the ritual slaughter of sheep. Recently, she has been instrumental in bringing an end to the Spanish tradition of bullfighting in Spain and elsewhere. Always outspoken and sometimes radical in her views, in January 2013, she threatened to give up her French citizenship and move to Russia like her friend, film star Gerard Depardieu, has done recently, in order to save two tubercular elephants from being destroyed under orders from French government officials. Brigitte Bardot has been for most of her life a symbol of French culture and one of its greatest champions. 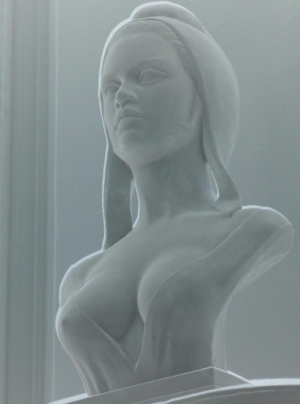 In 1970, when sculptor Alain Gourdon was commissioned to make a bust of Marianne, the French national emblem, he chose Brigitte Bardot as his model. When she threatens to give up her citizenship in order to save animals, her activism has real power to make positive change. She has also managed to anger and offend many people over the years by her sometimes radical perspectives on issues. Still — that willingness to stand up and take action for what she believes to be right makes her truly admirable. 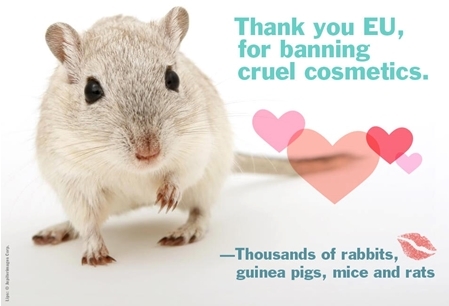 At last the EU bans stops the sale of cosmetics tested on animals! Animal lovers rejoice! Animal rights activists all over the world breathe a sigh of relief this month as the EU ban on the sale of animal-tested products finally goes into effect. The 11th of March will be celebrated by animal lovers for years to come as a day of victory! What a relief! At long last, the European Union wakes up to the idea that there are far better, less brutal ways to test the safety of products than to harm animals. Let’s hope the rest of the world takes similar action soon! Paul Penders International adopted a ‘no animal testing policy’ more than 30 years ago when I personally witnessed the cruel treatment of rabbits in a cosmetics testing laboratory. “… I can only remember thinking about the rabbits and how evil animal testing was. Why on earth should these animals be force-fed shampoo when no rational person would pick up a bottle and drain it down their throat? What was the point of all this unnecessary suffering? I made up my mind there and then, that none of my products would EVER be tested on animals, no matter the consequences.” (to read more of Paul’s autobiography, click here). As of March 2013, the new European ban makes it illegal to sell any personal care products that have been tested on animals – no matter where in the world those tests were done. That includes all beauty products – from high end to your local department store brands as well as all toiletries from soap to toothpaste. The EU Commission received so much pressure so that Commissioner Tonio Borg was considering applications for still further delay. As a last ditch effort starting in 2011, celebrities enlisted in the No Cruel Cosmetics campaign including Sir Paul McCartney, Morrissey and Sienna Miller, after it became clear the final phase of the ban might be delayed for up to ten years. For the last 23 years, we’ve applauded the efforts of the European Coalition to End Animal Experiments (ECEAE) as they work tirelessly towards the goal of ending all experimentation on animals. First established in 1990, the organization now represents 26 animal welfare groups in 24 EU states. The efforts date back even farther. Founded in 1898 by Frances Power Cobbe, an Irish writer and suffragette, The British Union for the Abolition of Vivisection (BUAV). 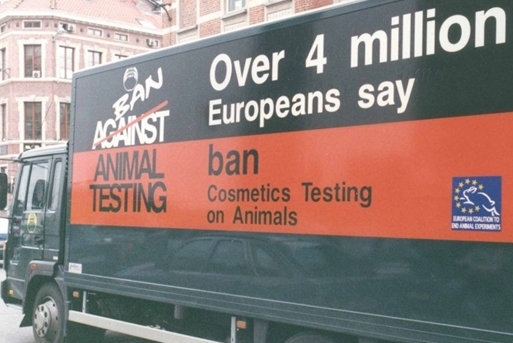 In 1973, the BUAV brought the use of animals in cosmetics tests to UK public attention for the first time, encouraging people to shop cruelty-free. This was followed up by the BUAV’s popular ‘Choose Cruelty Free’ campaign in the 1980s. As we now know, alternative tests for cosmetics are already available. Thankfully, Commissioner Borg ruled that the ban should go forward and now it will be integrated into the national law of each EU Member State. We rejoice with the millions across the world who stand up for an end to cruelty to animals.